Revelation 4:1-2 After these things I looked, and behold, a door standing open in heaven, and the first voice which I had heard, like the sound of a trumpet speaking with me, said, “Come up here, and I will show you what must take place after these things.” 2 Immediately I was in the Spirit; and behold, a throne was standing in heaven, and One sitting on the throne. The story is told of how the King of Russia, Vladimir the Great, brought Christianity to his Russian homeland in the year 988 A.D. With a mixture of truth and fable, historians recount how this immoral, pagan prince was looking for a way to unite the empire over which he ruled. Vladimir felt the best way to achieve his goal was to select a singular religion. Vladimir dispatched ambassadors to investigate major world religions at that time. Upon their return, each of Vladimir's ambassadors relayed their findings. Some noted that they saw laws and prohibitions on what to eat and what not to eat. Another said that the religion he witnessed did not seem to convey any real benefit to the people one way or another. However there was one Ambassador who is recorded saying these words to King Vladimir: “We knew not whether we were in heaven or on earth, for surely there is no such splendor or beauty anywhere upon earth. We cannot describe it to you. Only we know that God dwells there among men, and that their service surpasses the worship of all other places. We cannot forget that beauty.” Whenever people visit our churches, should they not come away with a similar response: "We knew not whether we were in heaven or on earth". How often have you heard it said: "That person is so heavenly minded they're no earthly good." The only response I can give to that is this thought: "Unless a Christian becomes more heavenly minded they cannot accomplish God's earthly good." 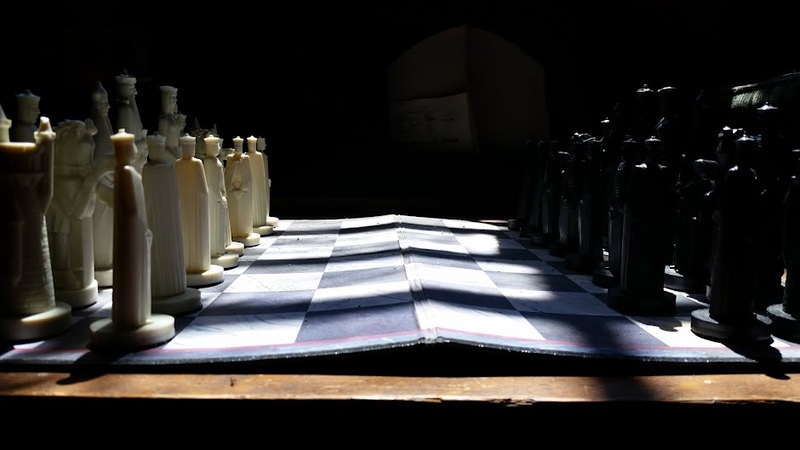 (Matthew 5:16; Colossians 3:1-3) Heavenly mindedness is the focus of today's blog, for it is central to the shifting of focus we see in the Book of Revelation. John begins Revelation with a vision of Jesus in Heaven in Revelation 1, followed by seven letters to seven churches in Asia Minor in chapters two and three. It is in Revelation 4 that we see John being summoned once again to consider the grand purposes of God in the heavenly realm. In today's post, we want to consider the value of being heavenly minded. We could nickname the Apostle John as the man who saw heaven by virtue of the fact that no less than eleven heavenly visions are recorded through the book of Revelation.1 Out of all the 66 books of the Bible (with the exception of Matthew), the book of Revelation mentions heaven more than any other, accounting for roughly 10% of the total times we find heaven mentioned in the Bible. The Apostle John dips his pen into the ink once again. He is transported in vision by the Holy Spirit to behold the court of heaven, where the Father is on His throne in Revelation 4 and the Lamb of God is seated in equal glory with the Father in Revelation 5. If we were to characterize Revelation 1-3 as being about Christ and His church, we could assign Revelation 4-5 as referring to Christ and His Heavenly Throne. John's particular vision of heaven here in Revelation 4-5 is the second heavenly vision of the book. Before diving into the vision that will follow in Revelation 4-5, I felt it necessary for us to explore in brief the scripture's teaching on heaven in today's post: The Bible's 4 heavens. We aim to understand today the places called heaven and then conclude tomorrow with the practical benefits of focusing our minds upon heaven. The subject of heaven in the Bible is immense to say the least. According to Dr. John MacArthur, the Bible uses the word "heaven" 582 times in 550 verses.2 Obviously we won't be able to cover all of those instances, however we can glean a fundamental sense about what the Bible has to teach about the four main places or "realms" called heaven. When the Bible says God "created the heavens and the earth", the word "heaven" in the text is rendered plural - telling us that there are multiple heavens. In Genesis 1:8 we see reference to what is termed "The first Heaven", the sky - "And God called the firmament Heaven. And the evening and the morning were the second day." Quite literally the word translated "firmament" comes from a Latin root, which in turn is a translation of the Hebrew original that means "a stretched canopy or covering". Much like when you pitch a tent and have to stretch the canvas over a frame, God took the atmosphere of Nitrogen, Oxygen and other gases and stretched them around the globe he had made. Psalm 147:8 reminds us - "Who covers the heavens with clouds, Who provides rain for the earth, Who makes grass to grow on the mountains." Already He had set the earth rotating about its axis as it was illuminated by His glory. With the first heaven, the sky, now in place, Earth would be ready for the Sun He would create on day four and the birds He would create on day five. The first picture on the left was taken by the Cassini spacecraft orbiting the planet Saturn on July 19, 2013. 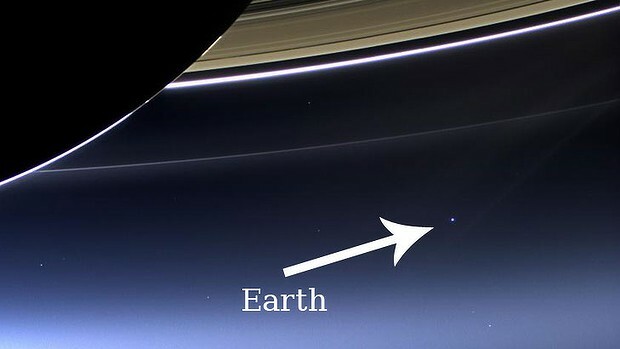 The picture captures the "pale blue dot" of earth suspended in the blackness of the universe nearly a billion miles from the Cassini probe's location. The second picture on the right comes from the Hubble Space telescope's survey of an area of the universe that is about the size of a needle's eye held at arm's length. This is a fine example of what we could call - the second heaven - the universe. In Genesis 1:14 we see the first reference the details of second Heaven or "universe" - . "And God said, Let there be lights in the expanse of the heavens, to divide between the day and the night; and let them be for signs, and for seasons, and for days and years". The second heaven is the domain of stars, planets, moons and space itself. By the time of Genesis 1:14, God had already created the space in which the earth was suspended. (Job 26:7-10) In continuing the stretching forth of the universe, God made the sun, the moon and later on the stars. (Genesis 1:16) Astronomers estimate our earth and moon, along with the seven other planets and other objects going around the sun, with their attendant moons, are sweeping through our Milky Way Galaxy at 500,000 m.p.h. Our Galaxy is composed of over 100 billion stars, with over 100 billion galaxies populating our universe. If you were to take a spaceship and travel at an average speed of 17,000 m.p.h, it would take you several days to reach our moon and nearly a year to reach our sun. To get to Saturn at the same rate of speed (like the Cassini Space probe above) would take you over five years! To measure the distances in space, the ruler used by astronomers is what is called "the light year", which measures the distance traveled by light in one year. Any signals sent by spacecraft such as Cassini travel at the speed of light, and take on average 80 minutes to reach receiving stations here on earth. To get to the nearest star traveling at the speed of light (670 million m.p.h) would take you four years (or over 100,000 years in the space shuttle!) However as you travel deeper into space, even the light year (some 6 trillion miles long) begins to lose significance, with our Milky Way Galaxy alone being 100,000 Light Years across, and our visible universe being composed of an estimated 100 billion such galaxies of smaller or greater size! As you study each of these "heavenly realms", each one gets larger and more different from common, everyday experience. Clearly we don't have any photographs of what the Bible terms "the third heaven" in 2 Corinthians 12:2. No other book in the world but the Bible gives us the necessary, sufficient and accurate description of this third realm. As we travel through Genesis, we see another 30 or so mentions of the word "heaven" with most references to either the first heaven (sky) or second heaven (universe). In Genesis 28:12 we read: "And he dreamed, and behold, a ladder was set up on the earth, and the top of it reached to the heavens. And behold, angels of God ascended and descended upon it." Though scripture up to this point indirectly alludes to the existence of a distinct realm in which God occupies as Sovereign and Lord over His creation (Genesis 2:1-3), as well as the existence of angels, yet this verse shows the activity of the third heaven touching down here on earth. According to John 1:51, what Jacob saw was none other than an Old Testament appearance of Jesus Christ. It is in 2 Corinthians 12 that the Apostle Paul refers to this realm as the "third heaven" (hence the reason for terming the first two realms as "1st heaven" and "2nd heaven"). From what we see in the Bible's descriptions of the third heaven, that realm of God's abode must be far larger and more grander than the second heaven - the universe. It is to the third heaven that believers go who die in the Lord. 2 Peter 1:10-11 includes this phrase: "for in this way the entrance into the eternal kingdom of our Lord and Savior Jesus Christ will be abundantly supplied to you." It would seem that the third heaven in comparison to the second heaven is greater than the second heaven (the universe) is to the first (the sky). What John will be describing in Revelation 4-5 confirms this notion - being that from the present third heaven, the Father and the Son are and will be orchestrating all of the events and coming judgments that will impact both the second heavens and the world living under the first heaven in Revelation 6-19. More could be said but for now we must move on to the the fourth major type of realm, a realm that is referred to as "the New Heavens". Many Bible teachers call this Biblical pattern an "already/not yet" experience, meaning that we are "already" experiencing a foretaste of the age to come, even though it is clearly "not yet" here. We can also say that when we as Christians experienced the New Birth, that greatest of all realities described at the end of the Bible is being "previewed" in us, since the Bible describes the Christian as a "new creation in Christ". (2 Corinthians 5:17) The Bible tells us in Revelation 20-22 that following the Great White Throne Judgment, a New Heaven and a New Earth will be established by God. Some have suggested that God will do away with this present order completely and re-create a whole new earth and a whole new Heaven. However it appears, from other scriptures such as Romans 8:21-25, 2 Corinthians 5:17, that God will somehow (in a way we don't completely comprehend) transform our current world and perhaps the third Heaven into that incredible reality spoken of at the end of Revelation. More could be said on these two thoughts, but I want to hasten onto the main point of Revelation 21. 1. Revelation 1; 4:8-11; 5:9-14; 7:10-13; 11:15-17; 12:10-12; 14:2-3; 15:3-4; 19:1-10; 21:1-9 and 22:16-21. 2. John MacArthur. "The Truth About Heaven, Angels and Eternal life". 3. George Eldon Ladd. "The Gospel of the Kingdom."